I often find that background noise makes recording difficult. I have often wondered if an external microphone would help. 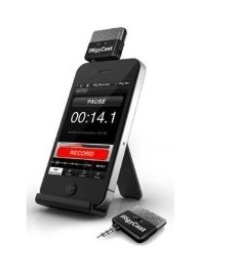 On line I have seen one called Multimedia IP-IRIG-CAST-IN Ultra- Microphone iPhone, iPod Touch, iPad. Has anyone tried external microphones? Do you have an FM system? My low-tech solution tht seems to work for short projects has been to hold my own microphone up to the iPad speaker when students share. I have also used my FM system as a microphone for students. It seems to work well. I haven’t tried any other external microphones.